What better way to personalize your gun than with a shotgun barrel decal, which is a decal specially designed to cover your shotgun barrel. WaterfowlDecals offers shotgun barrel designs made from high-quality vinyl that will appeal to any type of hunter. These catchy slogans will add a personal and humorous touch to your hunting excursions. 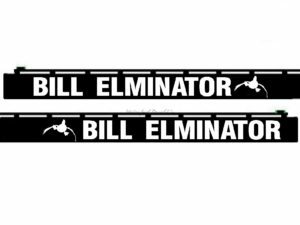 Our wide variety of shotgun barrel decals are custom made, with dimensions of 0.7’’ tall letters that are suitable for a 7 – 10’’ long shotgun barrel. Each order is for two decals, meaning you can customize two guns or place a decal on each side of your shotgun barrel. Air Traffic Control, Air Traffic Controller, Bill Eliminator, Blow My Load, Breast Collector, Duck Slayer, Duck Talker, Duck Terrorist, Fear No Fowl, Feather Duster, Feather Shredder, Feet Down, Flight Control, Fowl Intentions, Goose Buster, Grind Em’ , HuntEmUp.com, Quack Attack, Quack Quack Boom, Shoot Em in the Face, Show Me Your Honkers, Stackin Bills, Wack Em’ N Stack Em’, WaterfowlDecals, What the Duck Or your custom design. No matter your decal preference, WaterfowlDecals has a shotgun barrel design to perfectly suit your personality. These decals also make great gifts for your favorite hunter!